You’ve heard the term, but you may still be asking the question: What exactly is voice search? Voice search allows users to search the internet by speaking rather than typing. 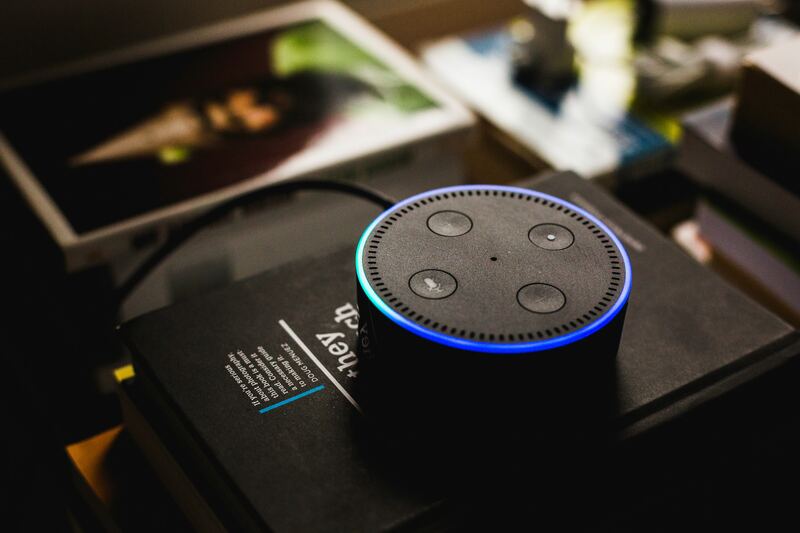 Today, there are several devices available on the market that allow users to conduct voice searches: Apple’s Siri, Microsoft’s Cortana, Amazon’s Alexa, and Google Home are some of the most popular options. Voice search is on the rise. In fact, a study by comScore projects that 50% of all searches will be voice searches by 2020. Are your customers using voice search? E-Marketer reported that the heaviest users of digital assistants are those between the ages of 25 and 34 and by 2019, 39% of millenials will use voice-enabled digital assistants. And according to a study from Bright Local, 58% of all consumers have used voice search to look for local businesses. How does voice search apply to your business? If you own a local store or a chain of brick and mortar locations, optimization for voice search is especially important. In fact, Search Engine Watch released a study which found that searches on mobile using voice were three times more likely to be local in nature than searches on mobile using text. Don’t wait until it’s too late. Be an early adopter and ensure that your business is ready for the voice search era. Here are seven different ways to optimize your SEO for voice search. The most important thing to think about when optimizing your SEO strategy for voice search is the needs of your typical customer. What are your customers likely to be searching for? What questions are they likely to be asking? Because voice search is conversational, it’s more likely that users will search using these very specific phrases. If you optimize for long-tail keywords -- for example by supplying lots of attribute content to Google -- you will be more likely to surface in search when you offer the specific service or amenity a user is looking for. Google recently reported that “near me” searches have grown more than 130% year over year. If you haven’t been optimizing for local SEO, now’s the time. Confirm that all of your information on Google My Business is correct (more on that later). Next, include landmarks or popular places around your business location in your local pages. Finally, add location pages to your website. Location pages provide readers with specific store addresses, product offerings, promotions, testimonials, etc. Having correct data across different networks is key to voice search optimization. Google doesn’t want to send their user to a restaurant that is closed for the day, or even worse, closed permanently. This is where listing accuracy comes into play. Google uses signals like accuracy and consistency to measure how much it can trust your information. Make sure to confirm your business name, address, phone number, and hours on all of the sites, apps, and directories that consumers use to find businesses like yours. Many of the most familiar sites and apps are also feeding voice search results. 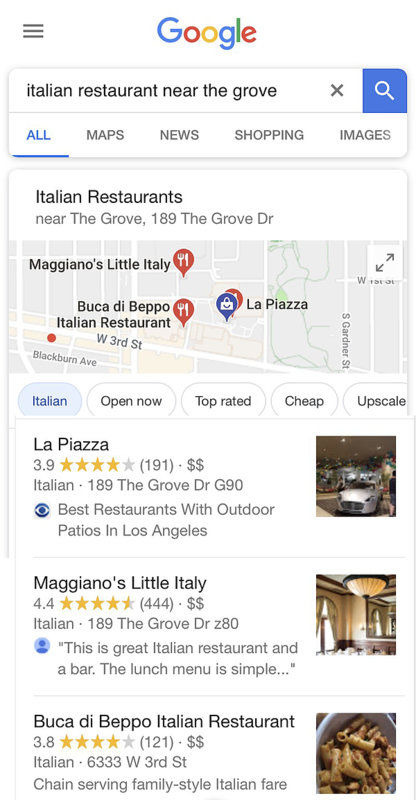 Damian Rollison, our VP of product, wrote a column on Street Fight about voice search and the importance of ensuring all information is correct on Google My Business, Apple Maps, and Yelp. For more information, read the article here. Improving your site speed helps ensure that search engines like Google and Bing (whose results power Alexa answers) will index your content properly. As a result, your content will more likely show up in voice search results. You can use Google’s PageSpeed Insights and check to see if your website is fast on all devices. A study conducted by Brian Dean at Backlinko, showed that 70.4% of Google Home result pages are secured with HTTPS. If your site isn’t secured, you can read Google’s guidelines here. Featured snippets appear in Google’s SERPs for certain searches immediately after the ads and sponsored posts. 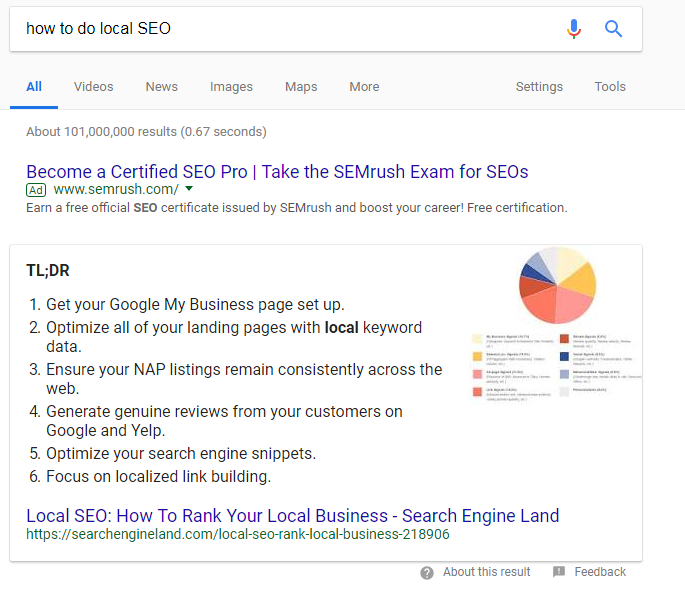 The screenshot above shows a featured snippet for “How to do Local SEO” from Search Engine Land. Voice searchers don’t expect to be presented with multiple results; they just want one answer. Backlinko concluded that 40.7% of voice search results are pulled from featured snippets. a) Provide high quality content. b) Optimize for long-tail keywords. c) Create an FAQ page. You can’t control what consumers say about you in reviews, but you can do a few important things to indirectly drive your reviews in a positive direction. First, make sure you’re responding to most if not all reviews on important sites like Google, Yelp, and Facebook. These sites offer the business owner the opportunity to respond to individual reviewers. According to Yelp, responding with a personalized message within 24 hours increases the likelihood by 33% that a reviewer will update a negative review and improve their rating. Second, pay attention to what your reviewers are saying. Remember, even negative reviews are often written with the intent of telling the business exactly what it needs to do to create an amazing customer experience. Learn from reviews, improve your service offerings, and better reviews will follow! Voice search is becoming more important for local businesses every day. Your competitors are optimizing for voice search. Shouldn’t you? We know that the information we just shared can be overwhelming, so we compiled everything into a printable PDF for you!